Our project was born from our passion for education.... wholistic education that connects the youth and the community. Rites of Passages are an ancient tradition, which prepares people to progress in life. The foundation of that progress is connection; connection to one's self, community, culture, and ancestors. Rites of Passages have been successful in creating meaningful education, academic success, and self-actualization, especially for marginalized populations (i.e. at-risk youth). So we have created Passage Packs, which are sent in the mail. Passage packs overcome the difficulty of travel, lack of resources, isolation, and disconnection. With this, anyone can facilitate and or experience a rites of passage. It's a DIY rites of passage kit! 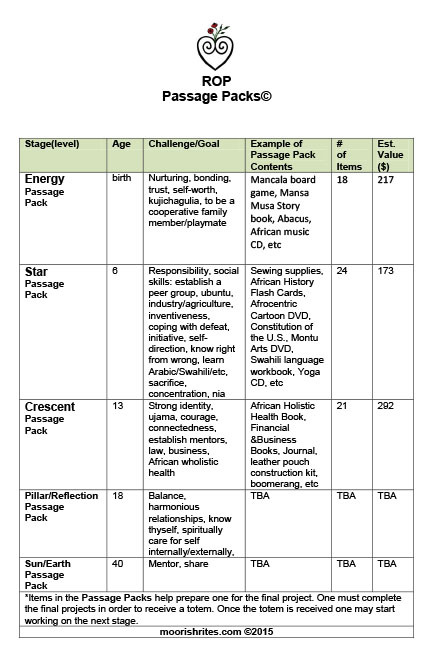 There are a total of 5 Passage Packs (outlined in the table to the left). Each pack facilitates a rites of passage for the respective stage by providing tools, toys, games, etc. While indigenous materials (i.e. mancala, boomerang, and abacus) and principles (kujichagulia, ubuntu) are used, the concepts are universal with the purpose of preparing people for success in this day and age. At Rites of Passage Learning Center, we have been facilitating Rites of Passages for years, but these programs are far and few in between. We want everyone, throughout the United States of America, who applies for the Passage Pack for his/her child or student, to receive it. Exploring a Passage Package could be the journey that improves a child's academic success and life chances, which in turn makes for a harmonious society. It is the gift of purpose. So, with your help we are raising funds to equip the Passage Packs (birth to 18) with enriching interactive materials as well as for packaging, and postage. Please donate whatever you can afford...$1, $10, $50...its doesnt matter! Each drop will eventually fill a bucket!